On the distant shores of an unexplored tropical continent, brave colonists strive to break with their devil-haunted past and make new lives for themselves in a land of plenty. Yet in fleeing tyranny, these colonists have also imposed their own, and the land's indigenous peoples have greeted the imperialistic settlers with open arms and leveled spears. This is Saregava: a nation on the brink of disaster, surrounded on all sides by pirates, hostile natives, and trackless jungles full of howling beasts and ancient ruins. Through its ports flood ancient treasures beyond imagination, brought forth from the wilderness by the blood and sweat of intrepid explorers. But can the colonists maintain their delicate balance, or will greed and their own deals with the devil see them swept into the sea? Details on the nation's major settlements, including ruined Kalabuto and the staunchly traditional port of Eleder. Adventure sites such as Barkskin Lake, Smuggler's Shyv, and the infamous magical prison known as the Stasis Fields. An overview of religion in Sargava, and how the colonists' faith interacts with that of local tribes. 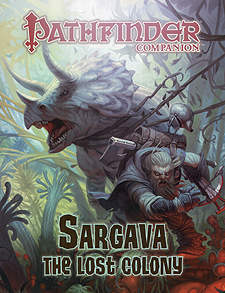 New spells designed to make life in Saragava easier on poorly adapted colonists, as well as combat feats drawn straight from the fighting styles of tribal warriors. This player-friendly Pathfinder Companion works best with the Pathfinder Roleplaying Game or the 3.5 version of the world's oldest fantasy roleplaying game. Although easily incorporated into any fantasy world, it is optimized for the Pathfinder Chronicles campaign setting.